A Reaming Shell typically sits just above the drill bit and helps maintain hole diameter, reducing the possibility of stuck tubes down the hole. It also acts as a stabilizer for the drill string at the bottom of the hole to prevent vibrations during drilling. The recommended practice is to alternate two reaming shells in each hole drilled to maintain hole diameter. Di-Corp offers high quality Reaming Shells to help assist with hole deviation and prevent premature wear of drilling tools due to vibration. It is set with natural diamonds in a wear resistant matrix which is reinforced on the leading edge with carbide wear strips to minimize erosion for longer life. Standard Reaming Shells – single ring, 15 cm (6”) overall length. Heavy Duty Reaming Shells – higher quality diamonds, single ring, 15 cm (6”) overall length (special request). Stabilized Reaming Shells – two rings, 25 cm (10”) overall length. 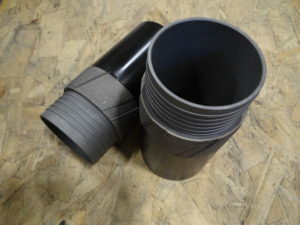 Oversized Reaming Shells are available for use with oversized bits, contact for more information. Available in sizes: B (Standard & Stabilized), BTK (Standard), BTW (Standard), N (Standard, Stabilized & Double Stabilized), NTW (Standard & Stabilized), H (Standard & Stabilized) and P (Standard & Heavy Duty).